There is no doubt in my mind that no one have ever produced more intricate exquisite technically supreme pieces of furniture than André-Charles Boulle. No one has come close to it and no one ever will. The amount of work, talent, and time he put into his pieces can never be matched. He was born in 1642 and died in 1732. By age 30, he was appointed as the Ebeniste du Roi (Furniture maker to the king) by Louis XIV. He is best known for marquetry work. André was not the first person to combine inlaying brass and tortoise-shell, but he was the one who perfected the technique. He perfected it so much that now any marquetry work that is done using brass and tortoise-shell is called Boulle work. Boulle work is done by gluing sheets of tortoise-shell and brass together and then cut out the design. The combination of première partie (a tortoiseshell ground inlaid with brass) and contre partie (a brass ground inlaid with tortoiseshell) is then formed. Hence a typical Boulle work will come in pairs. Despite being appointed as the Ebeniste du Roi, he wasn't favored much by the King. Instead, André provided furniture to the Queen, Grand Dauphin, Philipe V of Spain, duc de Bourbon and the Regent, duc d'Orleans. It was not until 1700 did Boulle supplied his first piece of furniture to the King. 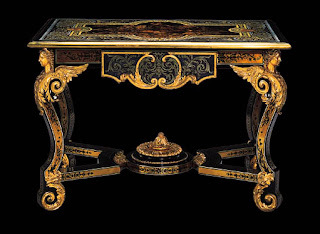 During the French Revolution, many Boulle works were scooped up by the Brits. And of course in late 19th century, robber barons brought them into US from England. Today, Boulle work can be seen in many great museums in US such as the Met, the Getty, and the Frick. They do come up for auction from time to time at Christie's or Sotheby's. But of course like in 18th century, you will need a very deep pocket to acquire one.